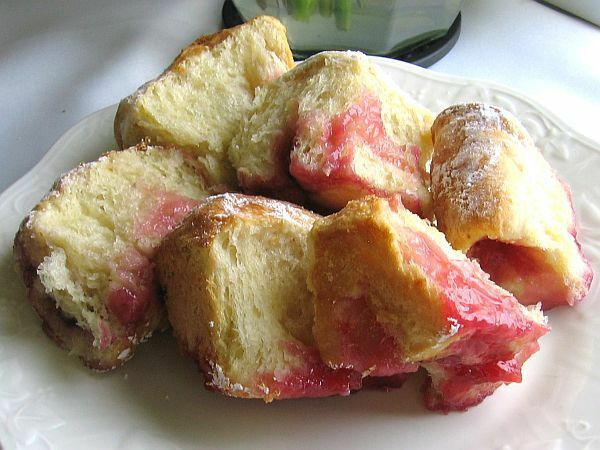 Hungarian Jam-Filled Sweet Roll or Bukta. © Barbara Rolek licensed to About.com, Inc.
Hungarian sweet rolls are known as bukta. When they are filled with jam, they are known as lekváros bukta. Bukta is called buchty in Czech and Polish. This recipe was adapted from "Helen's Hungarian Heritage Recipes" by Helen Szabo and Clara M. Czegeny. The recipe calls for sour cream but plain Greek yogurt can easily be substituted if that's what you have at home. The dough is easy to make and wonderful to work with. It can be served without the jam filling but are even better when stuffed with plum or apricot lekvar. Optional fillings are poppyseed, walnut, and sweetened cheese. I had just made some spiced plum jam and decided to use it and it worked like a charm. As with most recipes, there are endless variations and bukta are no different. Helen Szabo uses a sweet yeast-raised dough similar to what might be used for cinnamon rolls or houska without the raisins. Clara Czegeny says the word bukta comes from the expression "ki-bukni," which means to "spill or fall out haphazardly," because when the rolls come out of the oven, they are flipped out or spilled out of the baking pan. "Originally, Buchteln was a Bohemian sweet dish," Czegeny says. But, over time, they became part of the Austro-Bavarian-Hungarian cuisine. What an extraordinary treat these would make for an after-school snack, still warm from the oven! To proof the yeast: In a small bowl or glass measuring cup, combine yeast with 1/2 cup lukewarm milk and sugar. Sprinkle with flour and mix with a fork. Let proof until bubbly. To make the dough: In a large mixing bowl using a Danish dough whisk or wooden spoon, or a stand mixer with the paddle attachment, mix together flour, egg yolks, yogurt or sour cream, vanilla, and salt. Add 4 cups flour and mix. The dough will be crumbly at this point. Add the yeast mixture and remaining 1/2 cup milk, and mix until well incorporated. If necessary, add up to 1 additional cup flour to achieve a smooth, but sticky, dough. The dough will probably not clean the sides off the bowl. Scrape down sides of the bowl, cover with greased plastic wrap and let rise until doubled. Turn dough out onto lightly floured surface. Roll to 1/2-inch thick. Use a pizza cutter to cut dough into 2-inch by 2-inch squares (you can cut larger squares, if desired). Let rest, covered, 10 minutes while you prepare the baking pans. Line two (13x9-inch) pans with parchment paper (don't skip this step), then butter the parchment paper. Place about 1 tablespoon of filling of choice on each square of dough. Roll up, enclosing the filling completely. Place 25 rolls each, seam side down, into prepared pans, brushing tops and sides of rolls with melted butter. You want the rolls to be fairly close together so they grow together. Cover rolls with greased plastic and allow to rise until almost doubled. Heat oven to 350 degrees. Brush risen rolls with beaten egg. Bake 25-35 minutes or until golden. Remove immediately from oven. Let rest 5 minutes, then flip out onto a cutting board. Flip back, right side up and brush with any remaining melted butter. Place sweet rolls onto a plate and dust immediately with confectioners' sugar. Serve hot with hot vanilla custard sauce, if desired (see below). Bukta freezes well. To make the vanilla custard sauce: In a small saucepan, bring cream, milk, scraped vanilla bean, and 1/2 cup sugar to a boil. Reduce heat, add cornstarch and whisk constantly until sauce thickens -- about 5 minutes. Serve hot over bukta.